It may seem odd, having to woo a new generation into the teaching ranks – but the state’s teachers union has embarked on a mission to do just that. The train stopped this week in Kenmore. That’s where some 75 area teachers, students, lawmakers and college professors met for a couple of hours at Kenmore Middle School, to kick around ideas. Union leaders got an earful. High schools are filled with teachers, said Aaron Mendez – but there are no classes about teaching. Why not offer a teaching course? Others suggested a grow-your-own teachers program, like the one started in the Buffalo public schools, or simply identifying students with a knack for teaching. They could foster their talent tutoring peers. In practical terms, teacher certification in New York can be an obstacle, and the process needs fixing, explained Michelle Licht, a fourth-grade teacher in the Williamsville Central School District. Starting teaching salaries don’t compare to other professions and are considered another deterrent. Educators may not get rich, DiBrango agreed, but kids should know teachers in New York make a good living with a retirement system that provides for them in their older years. One person proposed a statewide public service campaign highlighting the rewarding aspects of the profession. But there's no better advertisement for the profession than good teachers, said Mark Bogacki. It was Bogacki’s seventh-grade science teacher who nurtured his enthusiasm for optics and encouraged him to do his own research. That’s what ultimately convinced him to pursue teaching as a career. 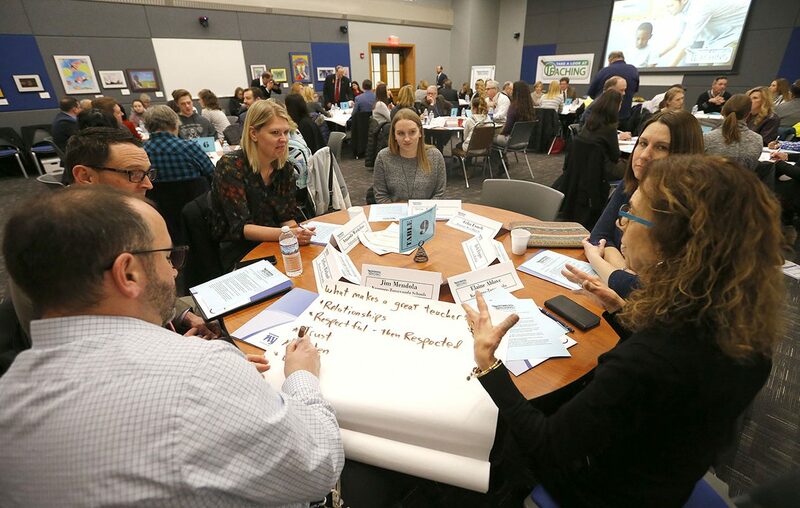 That’s the message educators want to send to colleges training the next generation of teachers, said Elaine Ablove, the director of staff development for the Kenmore-Town of Tonawanda School District. The summit on Thursday was hosted by Peter Stuhlmiller, president of the Kenmore Teachers Association, and Joe Cantafio, president of the West Seneca Teacher’s Association. The effort comes at a time when the unions feel their profession has been under fire and underappreciated in recent years, during a time of increasing accountability. In fact, the state teachers union – which boasts 600,000 members – also has been sounding the alarm, forecasting shortages in the years ahead based on the age of the current teacher workforce, projected retirements and fewer young people interested in the profession. While shortages aren’t prevalent statewide – at least not yet – there’s more of a problem in urban and rural districts, with high poverty rates and minority populations, and in certain subject areas, like special education or bilingual education. There’s also a noticeable drop-off in the numbers going to college to become teachers, which could cause problems in the future and is part of the reason for the cautionary tone. “In being proactive, we’re trying to not only attract people into the teaching field, but make sure we’re attracting diverse teachers so that they really represent the community,” Cantafio said.